Keeping the right level of Inventory to meet sales demand is a complicated process. Analytics gives you the ability to set priorities and take measured actions as required. 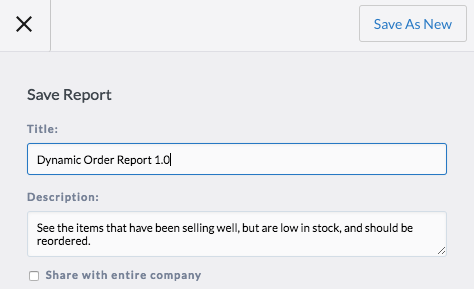 Knowing how much inventory to order needs to look at: expected demand for products, current availability of products, expected availability of products, and any discrepancies. Current availability can be measured by "Quantity on Hand"
Expected availability can be measured by "Quantity on Order"
As I mentioned in the discussion on best practices, asking for help is one of the best ways to find the best approach for calculations. This method of following inventory movement and from it harvesting action points is very much inspired by Tomer Shavit's work. If we open up the report, we'll see a metric called "days to sell out", this is looking at the average sale intensity over the past 90 days, comparing to the current level of inventory, and identifying how many days' worth of inventory is available. So now, how much should we re-order? So this gives us a working list of products that we expect will need some attention in the next 60 days. Now, seeing the measures for "Quantity on Hand" and "Days to Sell Out", let's calculate the average daily sales volume. Which produces a number for us, recreating the expected daily sales amount. Now, our question becomes, how much do we re-order? How many days worth of Inventory do I want? Now, in accordance with our best practices, let's save this report. So now we know what our desired inventory level is, but we have figured out how much to order. This becomes simple, we subtract our available Inventory from our desired inventory level. So now this highlights the difference between the desired amount and the available amount, or, the amount required!